I discovered space engine recently and am speechless. Anyways, I have some suggestions. First, Gas planets need to have atmospheres much, much thicker, like in real life. The actual "planet" should be the core, significantly smaller. Basically, you should be able to plunge thousands of kilometers into the atmosphere. Also, I think SE should have more variety in Terra-planets. Oceans arent always water, there should be a larger variety of sizes and colors. Hi. Gas giants already have several thousands km atmosphere. They probably don't look gigantic, because you move too fast. Also, the atmosphere system can't render thick opaque atmospheres: it was designed to render Earth's transparent atmosphere. I work on a variety of surface features a lot. Compare screenshots from previous version 0.94 and the current one. I believe city lights have been suggested before. But I'm not sure if the following has, but I think this is a good place to say it. I think just as there is a category for life bearing planets, there should be a much rarer and more specific category of advanced civilizations. I would classify an advanced civilization (in terms of space engine) as one with the ability to change the face of their planet- one with advanced culture and technology- type I, II, or III on the Kardashev scale. Although Earth fits into the category of "type 0", we still fit into those above qualifications and so we get the label too. Advanced civilizations depend on natural resources. As far as space engine goes, I think we should start with "home planets". Thus, the only planets with civilizations should be terra planets. Not deserts like mars, not selenas, nor gas giants or ice worlds. 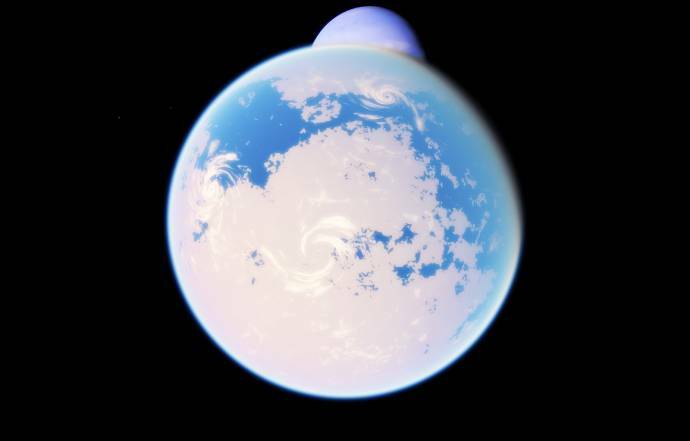 I don't want to sound naive about the possibilities for advanced worlds but as far as space engine goes, I think terras are good place to start. Advanced civilization planets will also have to be in a reasonable "Goldilocks" distance from their star, whether red dwarf or blue giant. Star-type should no more a factor for the formation of these worlds than it is for ordinary life bearing worlds. This would be really, really cool to see in the next version. Consider, when you're exploring in Space engine, and you find a planet with life, that could mean anything! I would be even more pleased if I found intelligent life- it would feel so much better to know you found someone and not just something. That one extra category should be good enough for (hopefully) .96. The following is just speculation for later versions. I think that maybe, a few versions down the line, we could add support for type for space-faring civilizations. This category would be even rarer, and would include one "home planet" as well as nearby planets that are colonized. I think that at most, Space engine should depict total solar-system colonization. Interstellar civilizations are too far down the line- besides, I would imagine that if we did add these planets, than the classification would be changed to be for the system as a whole. Either it has life-bearing planets, life-bearing planets with one advanced civilization, or a home planet with colonies (in order of rarer to much, much rarer). Colonies could exist on selenas or deserts or ice worlds. Complicating things beyond single systems would not be necessary until we figure out single systems. Like I said, that last paragraph is food for thought. It is the stuff before that I hope to see in the next version. Also, I would go as far as to suggest oceania planets, as there is no reason why intelligent life shouldn't be able to develop in an ocean. However, it would be less likely that they would colonize space and such a civilization would have only their home planet. Their "city lights" would be seen as a glow from space because the ocean blurs them. We could include them, but they would not be parts of space-faring civilizations. I wouldn't frown upon the idea of a colonized Oceania planet either. 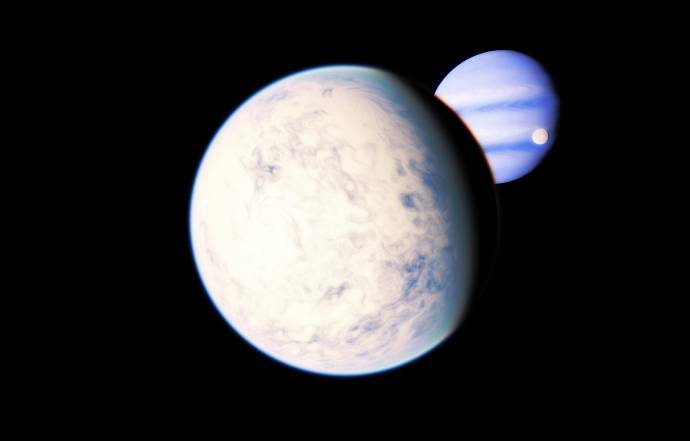 Let me also clarify something I said- I know some systems in Space Engine have multiple life-bearing worlds, and sometimes this could be attributed to the many theories that exist today on the subject. I was only referring to advanced civilizations. That was just related to speculation anyway. All I want in .96 are the single, advanced planets. Civilization in SE is a hard thing. Look at planets with life, even they have no lifeforms on their surface, just color and the words "with life" in info table. I plan to add some procedural vegetation later. But adding procedural civilizations... It may be too complicated. We have no idea to how they may even look. We have only one known civilization - our own. Why do you think every andanced civilization should use artifical lights to cover their planet? What it they have infrared eyes or no eyes at all (using for example sonar)? They may live under ground, or at bottom of sea (including planets with icy surface). Or they may even be invisible from our point of view: they may form some kind of global network and live in a virtual reality, so we may never realize that some big tree with pink levers is a part of a global intelligence organism (remember Eywa from "Avatar" ?). It was just an idea... you're right about the unknown methods of civilizations- I did get carried away in the description. I still think that from a distance, you would see artificial changes to planets. In our case, lights are the primary example of that. 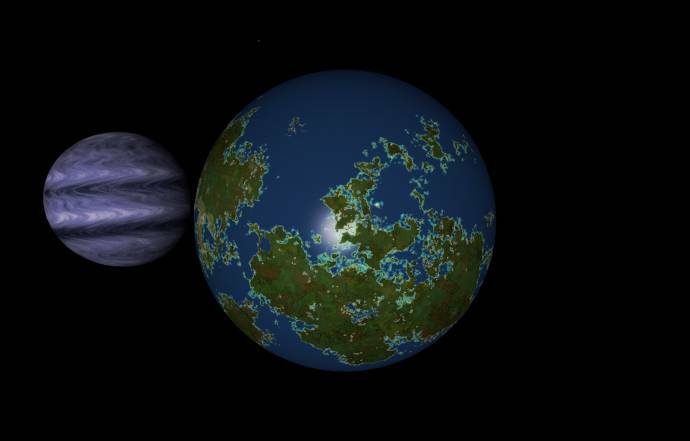 We could still have planets with cities; even if it is best viewed from space. I'm not trying to sum up the whole topic in one post. There are endless possibilities for alien life. Perhaps I rushed into the description. There are many different theories on what they might look like, how big they might be, how many organisms might comprise a civilization, social structure (independent individuals? several intelligent creatures with many followers? a swarm of creatures? ), etc. Also, remember that this is Space Engine. The life we are concerned about is the life that would one day have potential to colonize space. I can imagine some form of life would be less likely to leave their world than others. Notice I said advanced civilization. I did not say intelligent. That is the key, illustrating civilizations that somehow shape their world in UN-natural ways, enough to reshape their world. The kind of thing we would see in Space Engine would be ambiguous traits- things you would expect when considering merely the idea of a civilization or group of conscious entities, or network creating one entity. I will go as far to say a web-like structure as a basic example of a civilization. I think if a whole thread is set up, we can discuss the different possibilities. I still think its a good idea. Like I said, we are looking at life that could colonize space. Whether in a world of high or low gravity, the civilization still would have to escape the gravitational pull and support itself on spaceflights. Unless the life is on an asteroid or low gravity body, and I don't think space engine has small asteroids with that property- does it?) Some aliens may not have a way to support themselves (what ever "they" are) in space. Radiation may or may not be a factor in this. There are other factors, like perception of time, that come into play. Some life will be more likely to leave their home than others. There's no denying that. Another thought- how about adding the "with life" category to gas planets? Life is certainly capable of existing in them in some form. Even Aurthur C. Clarke suggested it in 2010. 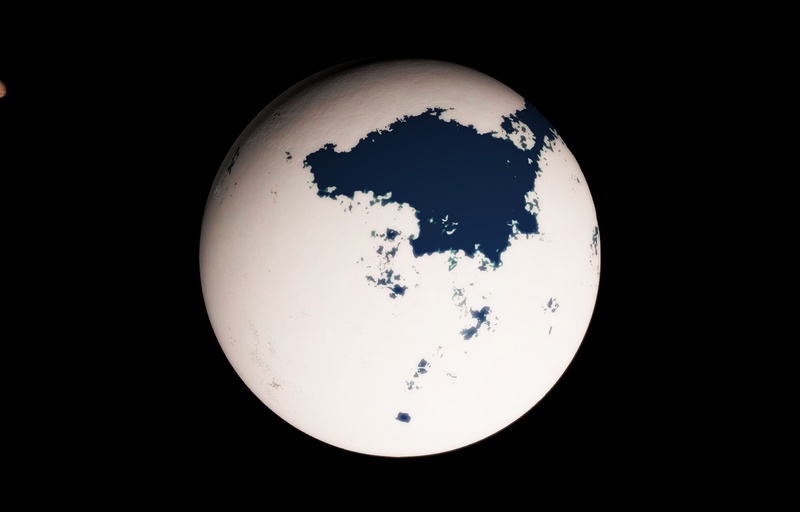 I plan to add life, even in oceans under ice crust of icy moons. I had origionally thought of making a new thread, but did a search for selena and figured that this was the best fit, even if it is kind of an old thread. There is plenty of fiction with gas giant life forms. Cool, now Sol will have 2 or more worlds with life in it Although they'd be hypothetical of course. Also, how about ice worlds that are large enough to maintain internal heat such as an Earth sized ice world that I found? Although the ice on such large worlds might be so deep that the pressure alone would keep it a liquid. Anyways, my main reason for posting is that I wanted to suggest more variety in Selenas since I've seen alot that are similar to each other such as Ganymede/Callisto looking moons (lots of ray craters), yellowish colored moons, etc. Yeah there is variety in crater placement and all that, but I'm seeing alot of repeat with a few procedural 'forms' IMO. Also, as has been posted in another thread suggesting non-Jovian (in appearance) gas giants, I agree with that thread in that there could be more variety with gas giants, although there is plenty of variety within the Jovian procedural appearance of gas giants. It would be nice to see terras with more varied distribution of clouds ice deserts and forests. To show what i mean i've created a few examples. These will normally be in the 290K to 310K temperature range and have an extensive cloud cover. These terras will be in the 265K to 220K temperature range and will normally have few clouds, few oceans and extensive ice sheets. Donatelo200, a thread about planet varieties already exists here. That the most interisting form of life i've heard, aren't we close at it? Definitely not a good idea, IMHO. I agree with your point about the single biome tropical planet though. What I'm looking forward to most is the inclusion of carbon and lava planets.